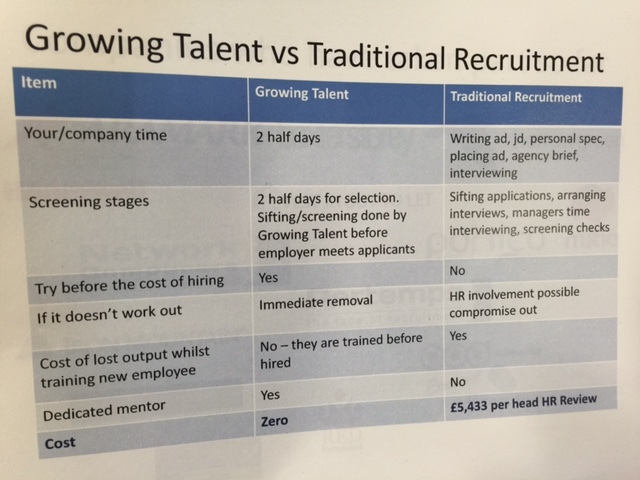 As part of the preparation for my presentation to an employers forum later this month, I decided to do a comparison of the key stages and costs between Growing Talent and traditional recruitment. As you can see from the table above, the results are clearly in favour of recruiting via Growing Talent. Time and money is saved and matches made are sustainable. None of the Associates who completed Growing Talent and moved into permanent employment has returned to benefits according to JobCentre Plus’s records. There are multiple benefits including the orientation week, holistic week, employer selection and training before hiring, dedicated mentors, Mental Health First Aider, personal finance, fitness, nutrition training that traditional recruitment doesn’t offer. All of this at zero cost to he hiring employer. So why aren’t more employers recruiting using Growing Talent? Next There’s a fine line……………..